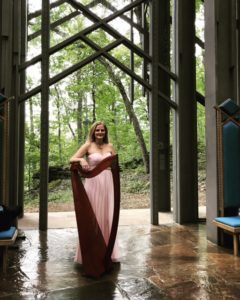 Hello, I’m Beth Stockdell, a harpist located in Fayetteville, Arkansas. Welcome to my website! If you are interested in having a professional harpist at an upcoming event, wedding, party, reception or funeral, please contact me for details and rates. I play a wide range of music and can help you create the perfect atmosphere for your special occasion. Here I am (in the photo on the left) in one of my favorite “office” spaces, Thorncrown Chapel. I was born and raised in Portland, Oregon. After traveling the world, I settled in Northwest Arkansas in May of 1999. I am joyfully married to Rick Stockdell (KUAF) and we love our life in Fayetteville. We are both voracious readers, football junkies, and love to travel. We are stewards of the Little Free Library #39136! As a lifelong artist working in photography, stained glass, multimedia painting, and handmade books(Etsy), I expanded my repertoire and started playing the harp in early 2003. I’ve taken my harp coast to coast for a variety of learning opportunities, trained with many great teachers and studied with an international group focused on healing music (Harp for Healing, National Standards Board for Therapeutic Musicians (NSBTM) ). I have been a regular volunteer for hospice playing for patients, family and staff and teaching about the benefits of healing music. I am a full-time harpist and play music all around Northwest Arkansas and beyond. I also work with the International Society of Folk Harpers and Craftsmen (ISFHC – Folk Harp Society) as Editor-in-Chief of the Folk Harp Journal magazine. I play often at local restaurants and do concerts in NWA. Please call 503-329-6881 (cell) or e-mail me at beth@stockdell.com. 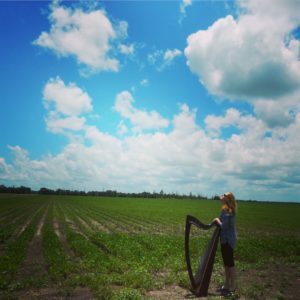 I’ll be teaching at the Harp Gathering in May, 2019! Come join me.